Christmas is out the way and everyone is settling back into routines etc, but I'm gearing up ready for my 22nd birthday which is on January 6th! There's not really much I could think of that I genuinely wanted for my birthday, but I had a quick browse and found some things that I would absolutely love, but are pretty unrealistic (price-wise) haha! A girl can dream, right??! What would be the point in a wishlist, without a ridiculously expensive, unrealistic item? Well how's this Michael Kors Rose Gold Glitz Watch - stunning! Isn't it? Retailing at around £260 I'm obviously not going to be receiving this as a birthday gift, but it would be so amazing! While we're talking jewels, one thing I have wanted for ages is a nice ring. Subtly hinting to my boyfriend hasn't worked haha, so I think I'll just buy myself one soon! This 9ct Gold Cubic Zirconia Wishbone Ring at Argos, not only really pretty but subtle too! I was flicking through a magazine a little while ago... don't you just love the perfume sample pages? I found a sample of the Viktor & Rolf Flowerbomb, which smells absolutely amazing! It was so nice, I ripped the page from the mag and hung it in my wardrobe so now all my clothes smell lovely too haha! Last but certainly not least, we all love flowers, don't we? Especially if they were delivered to our workplace in front of all our colleagues! I thought I'd have a look around and see whats on the market these days, I found this "Happy Birthday" Bouquet at Moonpig which is super pretty! Also, Debenhams Birthday Flowers & Gifts are beautiful, not to mention they have a wide range of other occasional bouquets! 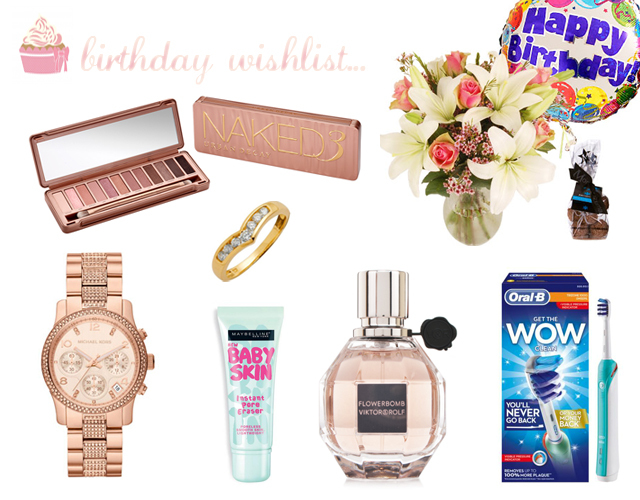 We have pretty much the same birthday wishlist! Hope you have a great birthday! Flowerbomb is one of my favourites! Can't wait to give that Maybelline primer a go either! Great post! Flowerbomb is my go to favourite when it comes to pefumes. I'd love to try out the Baby Skin too. Happy Birthday for when it comes! :) Hope you have a lovely day. Eeek, both January babies! I hope you have a lovely birthday! We both share our need for the Naked 3 palette!